Alice Kogan Weinreb is a member of the National Symphony Orchestra and has performed as a soloist with the orchestra at the Kennedy Center. She is co-principal flutist of Eclipse Chamber Orchestra, and premiered Truman Harris’ Concertino for Flute with the ensemble. Ms. Weinreb serves on the faculty of The Catholic University of America and teaches in the NSO Youth Fellowship Program. In the summer, she performs at the Grand Teton Music Festival in Jackson Hole, Wyoming. Ms. Weinreb studied in France under a Fulbright fellowship and was awarded first prize in flute at the Ecole Normale de Musique de Paris. 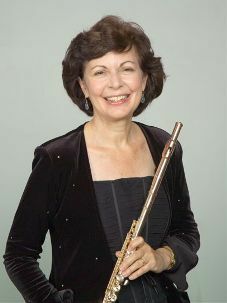 She is the featured artist on two recordings of works by Margaret Brouwer, Crosswinds on CRI and Light on New World Records. In February 2010, Ms. Weinreb premiered David Teie’s Butterfly Concerto with Eclipse Chamber Orchestra.